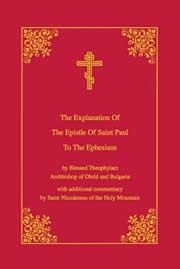 This book is the second volume published in the series of the Epistles of St. Paul. These works are the standard Orthodox Christian commentaries on the New Testament, condensing the wisdom of the Church since the time of the early church fathers. This volume incorporates an expansion of Blessed Theophylact’s work by St. Nicodemus of the Holy Mountain, an 18th century saint who speaks with the same voice as his predecessors. The Apostle Paul proclaims the greatness of God’s love for us, and our salvation in Jesus Christ, through the Holy Spirit. His epistle moves from the promise of the glory that awaits us when we turn away from our old sinful habits to embrace the richness of God’s grace. He returns again and again to the glory of His eternal will and purpose for us. Calling us to the fulness of the love of Christ, he gives instruction on how to love God and our neighbor. The commentary reveals the depth of every phrase, emphasizing the reality of the Church as the Body of Christ, and the building up of the temple of God.